Lake Mabprachan Villa. 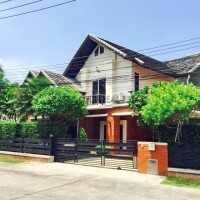 A very nice family home within the peaceful Mabprachan area of East Pattaya. Known for its slower pace of life, yet full of family activities and a large professional Ex-pat community. There are excellent highway routes to all of the neighbouring industrial areas, and only 10-15 minutes from Pattaya City Centre. The home has been designed with a modern theme throughout and all of the rooms look out into the large spacious garden. The garden is a total of 1,600sq.m which is certainly big enough for anyone to add their own private swimming pool design and create a serene tropical atmosphere. Inside the home the seller has left the property unfurnished, however there are nice en-suite bathrooms throughout and fitted wardrobes in each room. The kitchen has not been installed, again to allow the new owner to choose size, styles and colour schemes. The home has private covered parking for 2 vehicles, yet the driveway will accommodate more if necessary. All connection points for Satellite, cable TV and internet have been installed ready. The title deed is held in a Thai name with 50/50 tax and transfer fees.